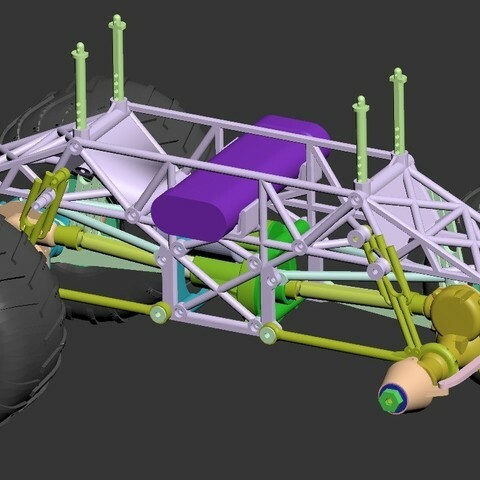 Fully printable monster truck with four link suspension and four wheel drive and steering with three differentials. 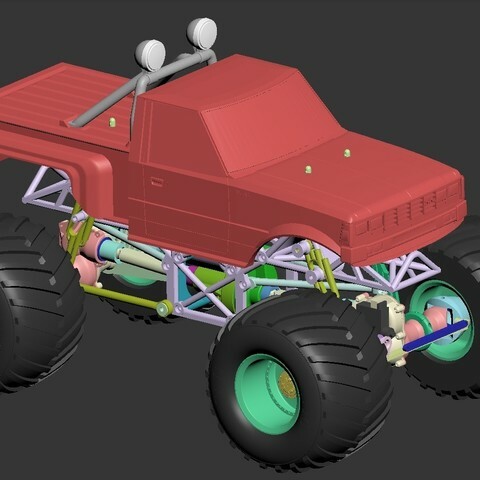 I wanted a monster truck that actually looks like a monster truck, and not a truggy with large wheels. If you want to support my work you can use any of the Ebay or Banggood-links below before making purchases. Added a new rollbar. Rollbar02.stl. Slightly easier to print and without lights. New side frames are up now. They allow side mounting of the batteries and are ideal for saddle packs for a lower CG to reduce the chance of rolling over. They can also be used with two shorty packs in parallel or even two full size packs if you want insane duration. Added medium length suspension arms. 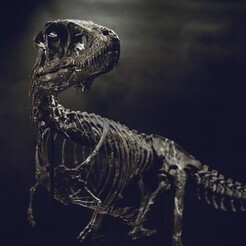 These fall in between the existing short and long arms. The files are MidWB01 and 02. I like to use short length suspension in the front and medium length in the rear. There was an error in the central gearbox housing. The new diff didn't fit. I have changed the the flattest side of the gearbox housing slightly to make room for the upgraded differential. Also new is a set of servo savers for the recommended servos. Servosaver02 is for the Corona while 03 is for servos with a larger 21 teeth flange. Attach the bottom half with M2x8 screws. Attach the top of the diff/input housing with M2x8 or M2x12 screws. Use an M2x8 or M2x12 screws to attach the ball on top. 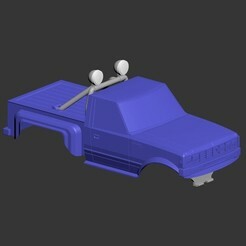 Added mirrors and windshield wipers for the body. A little bit of detail make s a big difference. I uploaded a photo of the car with them installed. I added new versions of all the drive shafts and hubs with holes and slots for a 2mmx13mm pin to increase the load capability and wear resistance of the rive couplings. The files start with "option - pindrives". Make the pins from 2mm piano wire or brass tubing. Make them 13 mm long. I haven't tried them myself yet, but pin drive works great with PLA in another project car other car. There was an error with the printable tire. It was wider than the wheel. I have uploaded Wheel02.STL which fits the printed tires. I also added new narrow tires which fit the original Wheels01.stl and take less elastomer to print. Added left and right tires for those that want to try printing tires. They are designed to fit the rims,and should be printable. New abuse video with a new lighter printed body. I printed it with 2% infill which saved 130 g. The rear diff now has two ABS bevel gears, which seems to hold up really well. I suspect ABS will be a good, cheap material for bevel gears. Changed the diff bevels slightly to improve gear mesh. Fixed a slight error in GB02. Added a servo saver and the associated links. Added a special version of the GB02 input called GB02-input-onepiece. It's a one piece part that requires that you pause the print between 22.2 mm and 23 mm and install both ball bearings before you continue the print. This creates a stronger part without gaps. Also changed GB02 with a stronger version after I broke mine while jumping. I made small changes to GB02-input and mating bevel gears (in gears01). If they break, the new parts have deeper gear mesh for higher strength. Made slight changes to the lower suspension arms to improve the strength of the screw holes of the clamps. Also slight changes to the outside of GB02 for strength around the bottom area. Still compatible with the previous version. Most of the parts have been changed recently, and I consider the design finished, so If you have downloaded parts earlier I recommend you download them again to get the latest versions. The drive train and spindles have all been upgraded. I added two optional short suspension kits for shortening the wheelbase. Use in the front, rear or both as desired. Each kit shortens the wheelbase by 20 mm. I uploaded shaft02.STL over again because there was a problem with the parts. The 3x19 mm rod wouldn't fit between the couplings. I added a new axle gearbox assembly which uses a new input shaft which doesn't require carbon rods or filing of flats on the rods. It's easier to make and is stronger. It is uploaded as GB02.STL and GB02-input.STL. I also updated Shaft02.STL with a more robust design. Note that GB01 is still available, but I recommend the new version. The new version replaces two of the 3x7x3 mm bearings per axle for the same 12x18x4mm bearings used everywhere else. I added a photo of the truck with a cool lexan body from Banggood.com. Also attached is a photo of body post drilling dimensions, and a photo of the frame without body. Check out the new video with the lexan body. Changed "Frame03.STL" with an extra cross tube and also made small changed to "Spindle01.STL". Working on all the rive shafts now so new GB-housings, shafts and couplings will come up some time in the next few days. I uploaded some stronger spindles and live axle housings with stronger spindle lugs. I made a body for it as well tonight. It is based on a Tokyo Marui Big Bear Datsun body, with modifications to better fit this truck. It has been widened to fit over the batteries and has special body posts. I attached photos both without and with paint. -Tighten the suspension arm clamps around the axle balls untill they allow some movement, but not too tight. The ball joint needs to be able to move with suspension travel. -The axle gearbox halves may have some uglyness in the top where the 7mm bearing goes. Just remove any excess plastic threads and stuff the bearing in there. I've done it to many units without failure. I might improve this part of the design later on. -Apply a small amount of grease to the inside of all drive joints so that the plastic knuckles don't melt from friction. I use cheap bicycle lithium grease. Any grease will do. -Apply grease to all gears. This prevents melting and keeps them working for long. I made closed gearboxes so that they could be greased without contamination. I use cheap bicycle lithium grease. Any grease will do. -The drive shafts and drive knuckles can be a little tight. They will bed in. -The gears will bed in if they feel rough in the beginning. Most of the gears seem to be very strong and show no signs of overloading. The differential bevel gears can break with very rough use if they are made from PLA. I eventually printed them from Taulman 910 nylon, which survived my torture tests. -The smallest differential gears need small shafts to hold them in place. Make these short pieces from 1,75mm filament. Super easy and plenty strong with five shafts on total per diff. -The lower links flex when the car rolls. This is by design and works well. 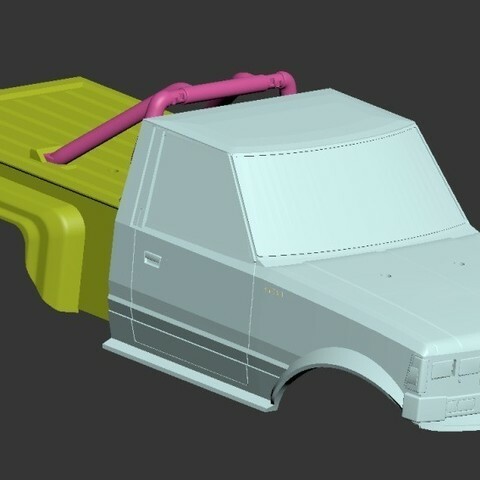 -Some parts have alternative parts so that the builder can create variations and change the look of the truck. -The screws all thread into the plastic parts without any metal nuts. It may be difficult to screw them in the first time. -Though the hardware list calls for machine screws, similarly sized self tapping screws will work fine in most cases. The exception being where the part is supposed to pivot on the screw, like the spindles and suspension link hinges. The length can also be different than the recommended in many cases as the holes are usually much deeper than necessary. -The rear steering servo needs to be reversed. If it can not be reversed in the radio the longer servo link can be used instead by connecting to the top servo arm instead of the bottom. -The diff lock gear is not recommended for jumps and high speed bashing because it increases the load on the whole drive train. -GB02 is recommended, but if you for some reason still want to use GB01, here are instructions: On GB01 The input shaft on the live axle is made from 3mm carbon fiber rod. File flats on each end to fit in the gear and shaft joint and . The flats don't have to be perfect. Also apply CA glue to the flats when assembling. The gear ratio between the input and wheels is 5:1. -Six cell Sub-C ni-mh battery or 2S hard body lipo ( https://www.banggood.com/Giant-Power-7_4V-6000mAh-2S-65C-Lipo-Battery-T-Plug-Hardcase-Pack-p-1080409.html?p=HD240528697332015103), or saddle pack for the newest saddle frame (recommended). -20 12x18x4 ball bearings. Search for "12x18x4 20pcs" on ebay for cheap bearings. -44 M2x8 screws - differential gearbox assembly, upper four link clamp and steering link assembly. 24 of them for assembly of the two piece wheels. -2 M2.5x22 screws - For mounting a 380 sie motor. 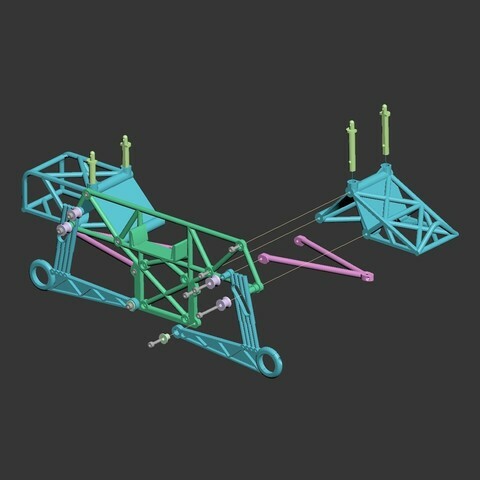 -22 M3x8 screws - Main frame assembly and steering spindle assembly. -8 M3x12 screws - Lower suspension link and upper rubber band posts. -6 M3x22 screws (M3x24 can also be used) - 540 Motor mount and lower rubber band posts. -4 M4x20 screws - For the wheels. 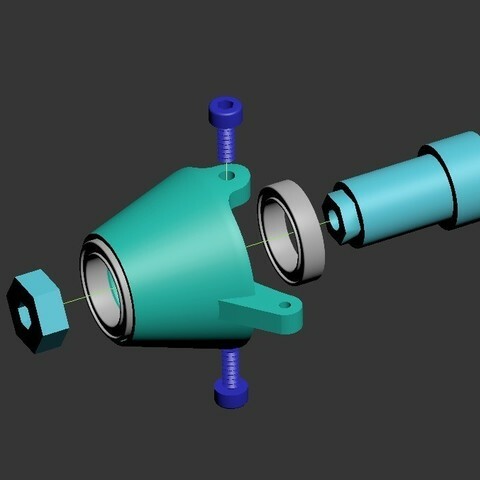 Steeringlink02.STL - Offset steering link for the servo saver. Servosaver01.STL - Servo saver for installing onto the servo arm. Bodypost01.STL - Shortest body post. Bodypost05.STL - Longest body post. Bodypost05.STL - Body post for the rear of the Banggood Vampire Ghost Lexan body. Use file Body04.STL for the front posts for that body. Suspension01.stl - Lower suspension links. Alternative 1. Choose the one you like. Suspension02.stl - Lower suspension links. Alternative 2. Choose the one you like. Suspension03.stl - Upper suspension links. Suspension04.stl - Lower suspension bushing and rubber band flanges. CGB-380.STL - Central gearbox and pinion for 380 size motors. 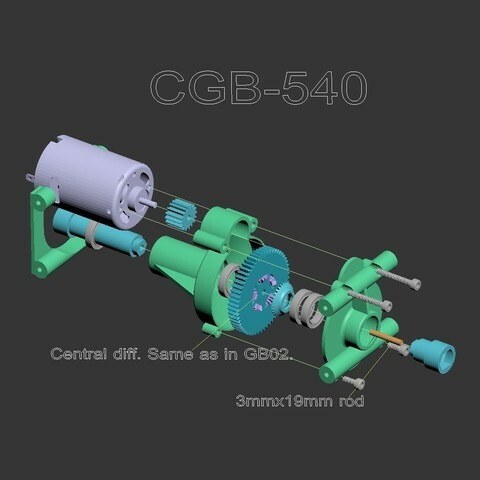 CGB-540.STL - Central gearbox and pinion for 540 size motors. CGB-gears.STL - Central gearbox gears. GB01.stl - Old version live axle gearbox housing. GB01-input.stl - Input coupling and bevel gear for the old GB01 housing. GB02.stl - New and improved version live axle gearbox housing. GB02-input.stl - Input coupling and bevel gear for the new GB02 housing. Difflock01.STL - Locking "gears" for the old style diff. Use if you want to lock the diff. Difflock02.STL - Locking "gears" for the new stronger diffs. Shaft02.STL - Central drive shafts. Frame01.stl - Main frame sides. Frame02.stl - Front and rear frame pieces. Alternative version 1. Frame03.stl - Front and rear frame pieces. Alternative version 2. Frame04.stl - Front and rear frame pieces. Alternative version 3. Wheel01.stl - Monster truck wheel. Narrow type. Recommended for bought tires. Wheel02.stl - Monster truck wheel. Wide type. Fits wide printed tires. 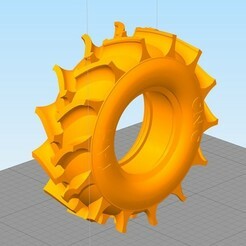 TireLeft.STL - Wide printable left tire. 83 mm width. Fits wide wheel. TireRight.STL - Wide printable right tire. 83 mm width.Fits wide wheel. TireLeft-narrow.STL - Narrow printable left tire. 73 mm width. Fits narrow wheel. TireRight-narrow.STL - Narrow printable right tire. 73 mm width. Fits narrow wheel. Body01.STL - The nose of the pickup body. Body02.STL - The cabin of the pickup body. Body03.STL - The bed of the pickup body. Body04.STL - Posts with extra room for the thick printable body. ShortWB01.STL - Suspension kit for shortening the wheelbase. option 1 arms. ShortWB02.STL - Suspension kit for shortening the wheelbase. option 2 arms. All parts are supposed to be printed in the orientation they open. No support should be necessary. The live axle gearboxes have cylindrical support built in, which is easy to break off after printing. The prototype was made exclusively from PLA. For the body I recommend printing with one perimeter only, and about 2% light infill (rectilinear or "fast" infills that don't cross over on every layer). The nose piece needs to have a plane to support the detail in the grille at 105 mm. The rear piece also needs a plane to support detail when it gets to 168.8 mm to support the inset pieces of the tail gate. I changed from 2% to 10% at these points, and added a few full layers to give support. For longevity, the bevel gears in the axle differentials can be printed from a tougher material, like Taulman 910 nylon. I did this to mine after a severe braking and acceleration test session killed the PLA gears. The central differential is fine in PLA. I printed just about everything with 30% infill. Wheels 15%. I recommend printing the spindles at 100%. Up the infill if you have problems. Good layer adhesion is very important for many parts, so no skimping on the temperature. I'm trying out a short wheelbase version of the suspension parts, which will suit the Big Bear body better. PRinting now and will upload if the shaft alignment still works with the shorter shaft. I was going to say, the body looks exactly like the big bear, then I finished reading your text! That's awesome! Question: does the big bear body fit on this chassis? My big bear chassis is pretty wrecked, from 35 years of driving.. But the body itself is in create condition, and still has it's original paint job. Would be great if I can print it a new chassis!